After reading part 1 & President Ikeda’s lecture on “The Supremacy of the Law,” it became clear that we could briefly touch on what the Lotus Sutra is & how it is relevant to the practice of Nichiren Daishonin’s Buddhism. Let us look at a short history. The Lotus Sutra was spoken by Shakyamuni Buddha (ca. 563-483 BCE), but it was not written down till the 1st century CE, 100’s of years after his death. This period is known to us as the former day of the law. Kumarajiva translated the Lotus Sutra from the Sanskrit to Chinese in the 5th century. In the 6th century T’ien-t’ai writes on the supremacy of the Lotus Sutra in his Maka-Shikan. From the end of the 8th through 9th centuries we have Dengyo , who also spoke of the Lotus Sutra as a fundamental teaching. This period of T’ien-t’ai & Dengyo is known as the middle day of the law. Moving from China to 13th century Japan we then find the Lotus Sutra’s title Myoho-renge-kyo, described by Nichiren Daishonin as the ultimate law, “Chanting Myoho-renge-kyo will therefore enable you to grasp the mystic truth innate in all life.” This is period of time is known as the latter day of the law. Dividing the way the Lotus Sutra is regarded for each (former, middle & latter) period, presents an idea from Josei Toda, who urged us to remember that the Lotus Sutra is ‘manifold,’ & to see “the Lotus Sutra of Shakyamuni,” “the Lotus Sutra of T’ien-t’ai & Dengyo” & the “Lotus Sutra of Nichiren Daishonin” This is important to note because it is not just a matter of picking up a copy of the 28 chapters of the Lotus Sutra, to then simply read it cover to cover & expect to get that same benefit as if one were chanting Nam-myoho-renge-kyo & performing Gongyo, as we do in our everyday lives. With this said, we shouldn’t be afraid to read the Lotus Sutra to enhance our understanding & to feel the beauty of the parables, prose & verse. Read it aloud to feel the majesty of its message, read it aloud to know what you say when you recite Gongyo. Don’t be afraid to enjoy it for what it is, as Nichiren’s inspiration & one of our fundamental Buddhist texts. The Lotus Sutra is also known to be the highest expression of Mahayana Buddhism. This distinction is made from a Hinayana (or Therevada: ‘teaching of the elders’) practice &/or sutras. This difference also has to do with the ways in which it is believed that a person can attain enlightenment. In the Hinayana tradition it is believed that the practitioner can achieve enlightenment only after leading an assiduous monastic life, this reclusion can lead to exclusion & thus enlightenment is open to only a select few. This is where we can indentify a tendency towards self-satisfied learning. This is in contrast to the larger capacity of Mahayana Buddhism & by extension explains the supremacy of the Lotus Sutra. In short, the Lotus Sutra is supreme because it is where we find the doctrine that anyone can attain enlightenment in this saha world. Rather than doing away with earthly desires, we are taught by Nichiren that earthy desires are enlightenment. Please keep in mind this is not the only reading Ikeda gives this passage, since it touches on the ten factors of life, which we don’t have the time to explain here. For our purposes, let us understand that this example is important & it is one of many examples in the Lotus Sutra where we are shown a relationship in terms of seeing the Buddhist potential within our very own lives & by extension to that of others & all of us as Votaries of the Lotus Sutra. What is the lotus Sutra? Myoho-renge-kyo is the Japanese title for the Lotus Sutra, Nam means devotion to, hence: devotion to the Lotus Sutra. Whenever we ask what the Lotus Sutra is, we may have to ask ourselves if we understand what Nam-myoho-renge-kyo is. Nam-myoho-renge-kyo is the ultimate law of the universe & it means literally: devotion to the mystic law of cause & effect through sound or word. 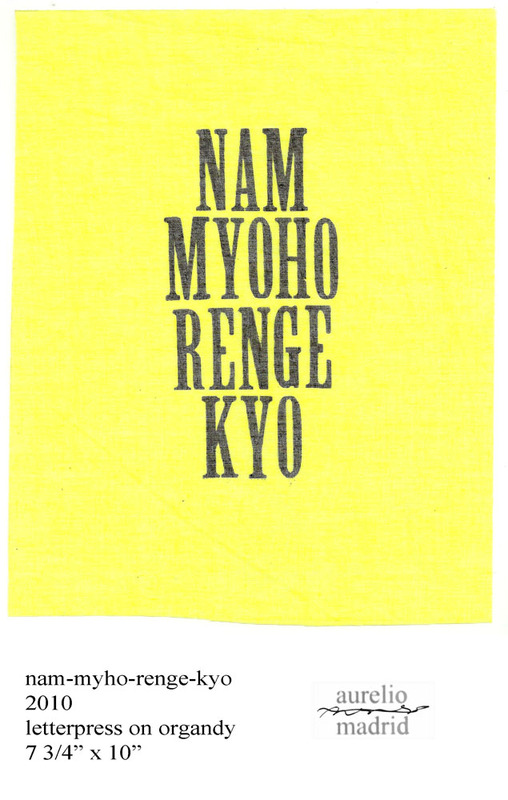 Nam-myoho-renge-kyo is the core of our practice & it is the essence of the Lotus Sutra as put forth by Nichiren Daishonin. Let this be a basic introduction to the Lotus Sutra if you haven’t heard of it before &/or let it be the continuation of your practice if you are already familiar with the concepts. I couldn’t give a comprehensive analysis. I could only, in this short time, write what we have here. Take these pieces & use them in your lives as needed, understand Nam-myoho-renge-kyo with your lives, understand the Lotus Sutra with others, fill your days with Buddhist practice & help others do the same. Please continue to open your minds to the goshos & the sutra. Study when you can to better understand your practice. Always remember that Faith, Study & Practice are the three pillars of Nichiren Daishonin’s Buddhism. …along with the faith & practice of daimoku, Gongyo is a recitation of portions of the Lotus Sutra: “The Expedient Means” & “The Life Span” chapters 2 & 16 respectively. This is performed twice a day towards the object of devotion known to us as the Gohonzon. Ibid. pp. 23-24. Expedient Means Chapter 2. first prose except used to recite Gongyo.